A cultural odyssey to see Brazil through the eyes of Pulitzer Prize-winning poet Elizabeth Bishop. Organize a journey to Brazil with the itinerary to be based around the homes and history of noted American Poet Elizabeth Bishop. I was excited when Irene came to me with her unique vision for a multi-generational literary expedition. She wanted to share this remarkable experience with her son Ron, a physician and poetry scholar, and her 11 year old granddaughter, Gemma. I was able to arrange an extraordinary trip that not only immersed Irene, Ron and Gemma into the life of Elizabeth Bishop but gave them deep access into her world. 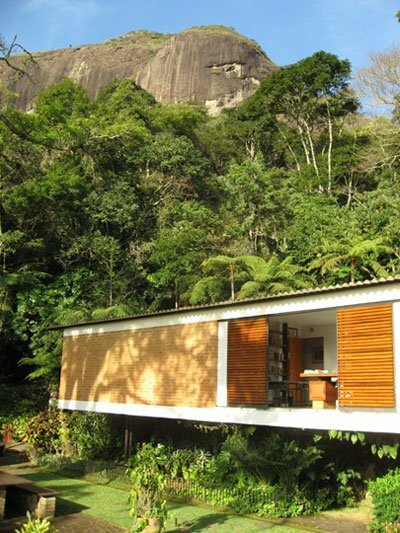 They started with a visit to the one-time home of Bishop, a privately owned estate named “Samambaia” set below a granite cliff in the mountains high above Rio de Janeiro. Access to the estate is seldom granted to visitors. Irene and her family spent a full day there, hosted by the current owner, a shipping magnate. Back in Rio, the family enjoyed a private audience at lunch with Oscar nominated film director Bruno Barreto (Dona Flor and Her Two Husbands). He’d recently directed Reaching for the Moon, a film about Elizabeth Bishop and shared stories with the family about his research for the movie. Later, they stopped by another home owned by Elizabeth Bishop and her architect partner, Lota de Macedo Soares, in Ouro Preto, Minas Gerais. There, the current owner welcomed and allowed them to explore and photograph the house. Irene, Ron and Gemma toured the town as well, visiting the same haunts and walking the same streets as Elizabeth Bishop had years ago. Capping off their Brazilian pilgrimage at one of the premier lodges in the Amazon Rainforest, Irene and her family spent a few days at the Anavilhanas Jungle Lodge.